SusieQTpies Cafe: Comfort Food Link up with Gooseberry Patch Yum yum! 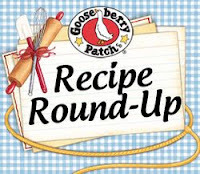 Comfort Food Link up with Gooseberry Patch Yum yum! Here is the latest from Gooseberry Patch: Homemade chicken noodles simmering away on the stove, Mom's meatloaf with buttery mashed potatoes, bubbly mac & cheese with a golden brown breadcrumb topping or a slice of fresh-baked apple pie...no matter what your favorite comfort food (Vickie's is nachos!) we're rounding 'em up today! classic recipes that we all love. Frequent contributor, Nancy Wise of Little Rock, Arkansas shared this homestyle recipe wtih us. She writes, "This recipe is full of down-home goodness…delicious warm from the skillet or wrapped in wax paper to savor cold as a picnic lunch." Pour buttermilk over chicken pieces in a large shallow dish; cover and refrigerate for one hour. Combine one cup flour, salt and pepper in a large plastic zipping bag. Drain chicken and add to bag, one piece at a time, shaking to coat. Place on wax paper; let stand for 15 minutes. Heat 1/4 inch oil in a large cast iron skillet over medium heat. Add chicken; cook until golden on all sides. Reduce heat to low; cover and simmer for 40 to 45 minutes, until juices run clear. Uncover; cook for an additional 5 minutes. Drain chicken on paper towels; keep warm. For gravy, pour off all except 1/4 cup drippings from skillet. Stir in remaining flour over low heat until well blended; gradually add milk. Slowly stir in water; bring to a boil over medium heat. Cook for 2 minutes until thickened, stirring constantly. Add salt and pepper to taste. Serve gravy with chicken. Makes 6 servings. recipes below and do you want to add this hop to your OWN blog? Lovely Site, Stick to the great job. With thanks!